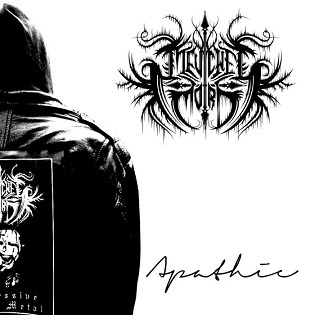 Meuchelmord are a solo project from Germany that plays a very depressive form of black metal and this is a review of his self released 2015 ep "Apathie". Tragic sounding keyboards start off the ep and after a few seconds elements of electronic music are added onto the recording before adding in more of a heavy and depressive black metal sound that also uses very melodic and atmospheric sounding guitar solos and leads and on the second track the music gets more structured. When vocals are added into the music they are very high pitched depressive black metal screams and all of the songs have a very modern approach to the genre and a small amount of clean playing can be heard in some parts of the songs and also adds to a touch of post rock to the tracks and as the ep progresses clear singing can be heard briefly and the whole recording sticks to either a slow or mid tempo musical direction. Meuchelmord plays a style of black metal that is very depressive while also mixing the post, atmospheric and melodic sides of the genre into the songs to make the music stand out a bit more, the production sounds very dark and raw while the lyrics are written in German and cover depressive themes. In my opinion Meuchelmord are a very great sounding depressive, post black metal project and if you are a fan of this musical genre, you should check out this ep. RECOMMENDED TRACKS INCLUDE "Jahr" and "Regeneration". 8 out of 10.